The definition of public art continues to evolve, but at its most basic level public art can be defined as “work created by artists for places accessible to and used by the public.” In other words, there’s no velvet rope ‘twixt the art and the patron. It’s worth noting that the art/public art field distinguishes between “public art” and “art in public places.” The former term implies a contextual, often collaborative approach to the creation of art that takes the site and other local factors into account, while the focus of the latter is on the art itself, not where it will be sited. Put another way, “public art” is site-specific, or designed for a particular environment – for instance, a university campus. Whereas other collections – for example, UCLAs Murphy Sculpture Garden – consist of acquisitions, all works in the Stuart Collection are commissioned; prominent contemporary artists are invited to survey the campus and develop proposals based on their site selection. Proposals are reviewed and approved by an Advisory Board, and most of the works are constructed on-site rather than in a studio. The Collection also differs in its funding model. Other collections, such as the J. Michael Bishop Art Collection at UCSF Mission Bay, typically rely on a percentage of construction budgets (1% is common) allocated for public art, but the Stuart Collection is entirely self-funded by grants and donations. An unusual emphasis on variety is another hallmark of the Stuart Collection. Unlike a conventional sculpture garden the works span a variety of forms, materials, genres, etc., and are often “one of a kind” in relation to the artist’s body of work. As the pieces are varied, so too are the artists themselves, ranging from painters (Elizabeth Murray) to installation artists (Nam June Paik) to composers (John Luther Adams). Several of the artists who’ve created pieces for the Collection are not otherwise known for public art (John Baldessari, William Wegman, Terry Allen). However varied in their form and function, all of the pieces in the Stuart Collection share a common goal. They don’t proselytize or attempt to define “good art” but, in the words of artist Bruce Nauman, they do ask the viewer to “pay attention,” to regard their familiar environment in a different way and, in the process, perhaps see themselves in a new way as well. 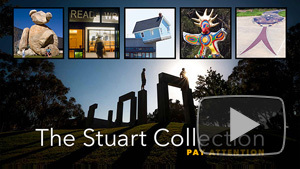 Watch Pay Attention: The Stuart Collection at UC San Diego, then browse more programs that explore UCSD’S Stuart Collection. It’s time for another stop on UCTV Prime’s tour of UC’s most prestigious public art collections –“Naked Art,” as we like to call it. This week it’s all about UCLA’s Murphy Sculpture Garden, which spans more than five acres on the Westwood campus and boasts more than 70 sculptures by artists such as Jean Arp, Deborah Butterfield, Alexander Calder, Barbara Hepworth, Jacques Lipchitz, Henry Moore, Isamu Noguchi, Auguste Rodin, and David Smith. We visited the tranquil setting on a sunny January morning and spoke to the collection’s curator from UCLA’s Hammer Museum, Cindy Burlingham, professor and artist James Welling, and some UCLA students who pick this special location to study, relax – even practice their fire-spinning technique! Take a virtual study break and discover UCLA’s “Naked Art” on UCTV Prime, our new YouTube original channel. You can also check out photos from our visit to the UCLA Murphy Sculpture Garden on our Facebook page, and find out more about public art at UC on our “Naked Art” series page. If you haven’t already, stop by our “Naked Art” YouTube playlist to watch the first stop on our public art tour at UC San Diego’s Stuart Collection and a catch a trailer for next week’s episode that shows what happens when public art meets science and research on UCSF’s new Mission Bay Campus. And don’t forget to enter the “Show Us Your ‘Naked Art’ and Win!” contest for a chance to win a book about UC San Diego’s Stuart Collection or UCLA’s Murphy Sculpture Garden. And, of course, subscribe to UCTV Prime’s YouTube channel to keep up with our latest programs, such as “Prime: Vote,” a new series premiering March 13. The first installment features insightful and reasoned commentaries by three UC faculty on important issues the country and candidates are facing during the 2012 election season.